NEW YORK, NY--(Marketwired - Jun 6, 2016) - Let the sun warm your skin and the music embrace you this summer with the new Altec Lansing Omni Jacket collection of portable speakers. The Omni Jacket lineup is the newest addition to Altec Lansing's legacy of everything-proof speakers and features the Omni Jacket Mini, Omni Jacket and Omni Jacket Ultra. These powerful speakers deliver omni-directional, dynamic sound from every angle allowing you to literally feel the music. The Omni Jacket lineup is waterproof, shockproof and sandproof -- basically everything proof and they float, keeping the beats flowing -- anytime, anywhere. The full Omni Jacket collection pricing ranges from $99.99 to $299.99 and are available at Target and Sam's Club. Whether you are sitting in the backyard, splashing at the beach or off-road biking, the Omni Jacket will help set the soundtrack for summer. Offering hours of omni-directional DSP-enhanced sound, convenient app-control functionality and hands-free operation responsive up to 50 feet away, you can control the speaker by barely lifting a finger. The Omni Jacket and Omni Jacket Ultra sync with your smartphone and feature an onboard microphone, giving you wireless call-answering ability. The lithium ion battery provides hours of playtime and includes a power bank to charge all your USB devices. To top it all off, the collection is compatible with Apple, Android, BlackBerry, tablets and laptops and is available in an assortment of colors. Waterproof, shockproof, sandproof and floats! 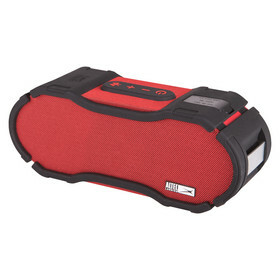 To learn more about Altec Lansing products, including its new Omni Jacket speakers, please visit www.alteclansing.com. For almost 90 years, Altec Lansing has been shaping the history of sound delivery by producing exceptional speakers with legendary acoustics, while catering to the consumer who won't compromise sound quality. The company boasts a unique history of innovation that includes the introduction of the first "talkie" film speakers, the first set of desktop computer speakers, and the first iPod, iPhone and iPad docking stations. Always entrenched in the music community, Altec Lansing continues to be a first choice for musicians and audiophiles alike. Those who know audio, know Altec. For more information, visit www.alteclansing.com.